Lightweight, compact and portable, the FENGJIDA 10.5-inch DVD player is designed with the purpose of entertaining people by enjoying their favorite movies and music on a road trip or simply at home. The types of disc it supports include DVD, VCD and CD of all regions. Moreover, USB and SD card files can also be decoded and played on this player just by choosing correct formats. 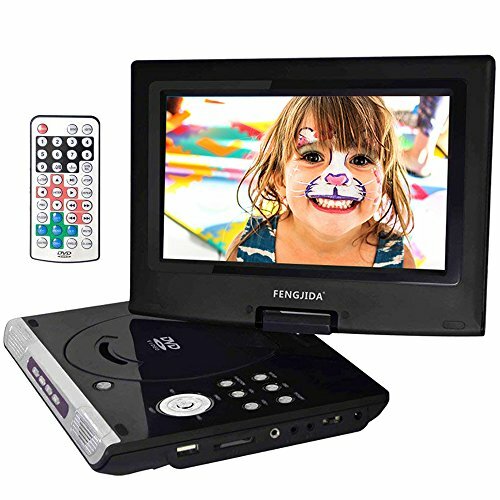 The FENGJIDA portable DVD player has a swivel screen with 270 degrees rotation and 180 degrees flip which allow easy positioning, so you can find the best angle for viewing and quickly get comfortable on a couch, in a chair or even on a plane. All players come with wall charger and car adapter, ensuring that it can be used for longer, anytime and anywhere. The high quality TFT LCD screen and dual full-range stereo speakers give you best audiovisual experience you could expect from a DVD player. View More In Portable DVD Players. If you have any questions about this product by FENGJIDA, contact us by completing and submitting the form below. If you are looking for a specif part number, please include it with your message.